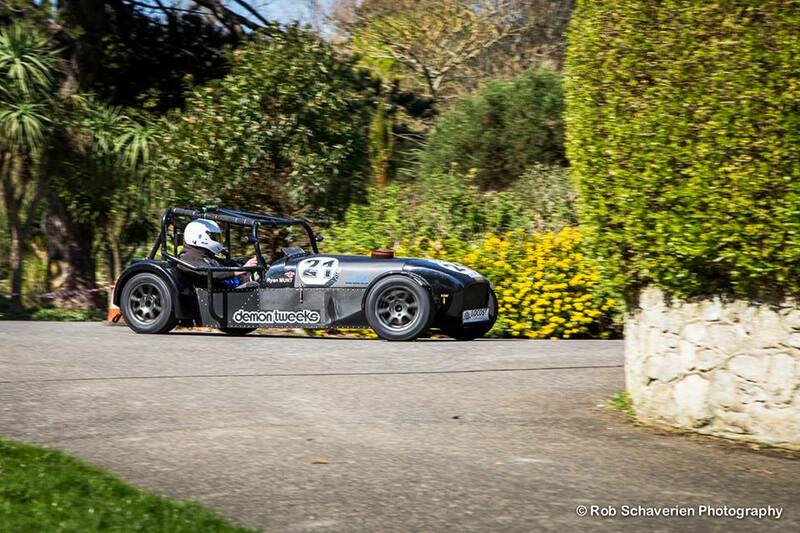 After finishing second last time out, Ryan Munt claimed overall victory at the second round of the 2015 Isle of Wight Car Club season, held at the Ventnor Botanical Gardens. The layout for the day’s action was extremely demanding, rewarding those with the skill and bravery to successfully extract the best time possible. Munt’s closest rival on the day was Steve Wells, who was once again sharing with Munt. The two drivers were closely matched during the day, but before Munt’s final run, Steve Wells had a grip on the lead. Munt looked to be on maximum attack as he tackled the course for the final time, and his reward was a time of 57.61 – giving him the victory by just eight hundredths of a second. Toby Allen came home third overall and first in Class Four in his Lotus Elise; He was the only other man to record a time below 60 seconds during the day. David Goodwin took the Class Three win in his modified Mini, taking a careful approach in order to lap the course without any time penalties for knocking over cones – Even Class Two victor Dean Long, who is well known for his Drifting, kept his Mazda MX5 composed due to the challenging nature of the layout. Debutant Drew Howells took the Class One victory by less than a tenth of a second in his Mitsubishi Colt, closely followed by fellow rookie Charlie Turpin. Vicky Cox was the quickest woman of the day in her Peugeot 205. Well done to everyone who made round one a success, now from one of our smaller venues to something entirely different! I’ve attached the check list our scruitineers will follow when inspecting your car, drivers are expected to leave their cars readily available for inspection so open, with the bonnet / boot unlatched. Next Sunday the 19th April see’s Round 2 at Ventnor Botanical Gardens. Please if Possible use the advanced payment function with paypal on the website! If your trailering to the event please ensue you leave enough time to be directed to move your trailer to the trailer park prior to sign on, remember sign on will close at 9:30. Will are going to continue trialling passengers at this next event, passengers will however need to hold a full drivers licence or MSA race licence.